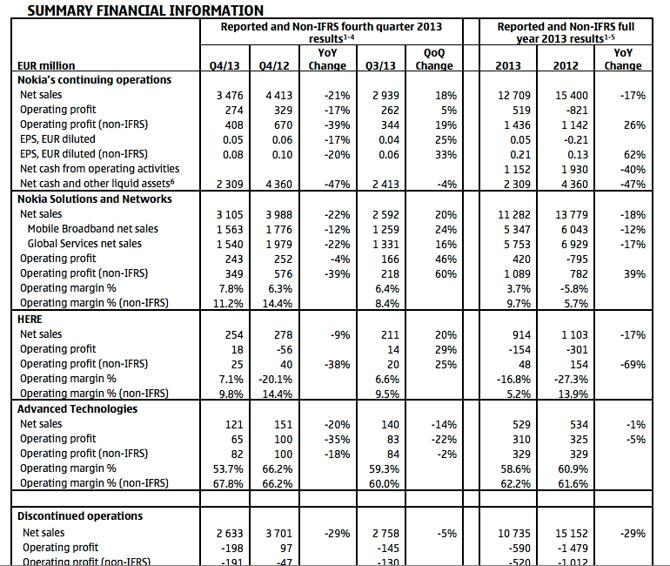 Thursday morning's release of Nokia's (NOK) Q4 2013 earnings report was met with a sword to the gut with no shield in hand. Nokia brought too many negatives and too few positives to the table when presenting to investors, and the future of Nokia continues to float aimlessly around in the air. The majority of investors who were expecting either the unveiling of Nokia's new strategy moving forward [after device sale to Microsoft (MSFT)], the revelation of a new CEO, or the identification of the vehicle(s) Nokia would utilize to distribute upwards of $4 billion in excess cash to shareholders, were extremely disappointed when Nokia announced they would keep mum on all of these subjects until after the deal officially closed with Microsoft, which is still expected to take place sometime in the first quarter of 2014. On top of that, revenues from all three of Nokia's remaining business divisions, NSN, HERE, and Advanced Technologies, declined year over year, which is discouraging to all investors, especially those who jumped in after the Microsoft tie up was announced. However, while Nokia has disappointed investors this past quarter, the company has generated returns of nearly 70% in the past year, and investors on the fence need to take a step back and look at the bigger picture in order to understand where this company is situated in its turnaround phase, and how much further it can potentially go. 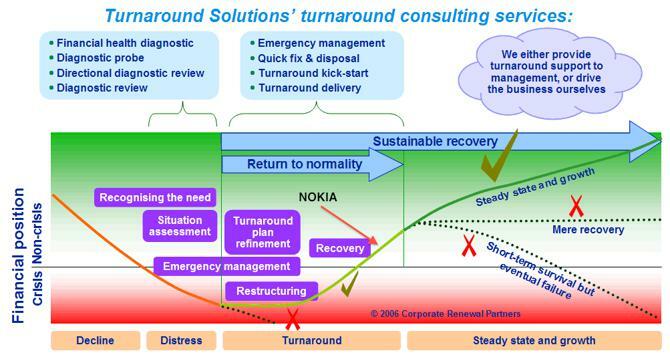 Nokia has transformed into an entirely new company right before our eyes, and it should be expected that the company experiences a few hiccups during its transition phase. Just a year ago NSN was a 50/50 joint venture that received little attention and was just reaching profitability. Now the division accounts for approximately 90% of new Nokia's total revenues. A lot has changed in a short period of time for the Finnish communications company, and the more than yearlong restructuring efforts taken on by the company should pay off immensely for investors who can sit tight on their holdings. With a strong balance sheet, three profitable divisions positioned in rapidly expanding markets, and a value creating multi-billion dollar deal waiting to be closed in the next two months, Nokia presents a compelling opportunity for both short and long-term investors. At current sell off levels (~$7.00), short-term investors can capitalize off of the impatience of others by opening a speculative position in Nokia and selling into the news of the closing of the Microsoft deal (highly expected), which would be a 1-2 month play, and long term investors can sit back and collect a soon to be reinstated dividend while watching Nokia's future pan out, depending on the strategy they announce once the deal closes and how that fits in with your personal investment goals/needs. Overall, Nokia shares have entered oversold territory, experienced an irrational selloff after their earnings report was released, and a bounce back higher should be expected after such a steep decline for a fundamentally improving company that is well on its way to completing its multi-year turnaround. In nearly every division, revenues and margins decreased on a year over year basis, but increased significantly on a sequential basis, a testament to the fact that Nokia is indeed digging itself out of a hole and continuing to build momentum. Nokia's Solution Network has been experiencing strong momentum in China, with several recent contract wins, and the company attributes seasonality to NSN's strong sequential performance. However, NSN's year over year decline of 22% was attributed to restructuring costs, foreign currency fluctuations, and the "divestments of businesses not consistent with its strategic focus, as well as the exiting of certain customer contracts and countries." With recent contract wins from China Mobile (CHL), Sprint (S), and Chunghwa Telecom (CHT), NSN is poised to post improved figures in the future as it increases its scale and takes care of necessary one-time charges. Nokia's HERE division continues to represent the "I think I can, I think I can" engine that is trying harder than ever to prove its value to both shareholders and commentators. While the division's revenue is peanuts compared to NSN, and its margins are laughable compared to Advanced Technologies, HERE has a competitive advantage thanks to its massive car install base, and has the ability to present significant value to its shareholders in the long term. The company is focusing on continuing its development of the autonomous car, its 3D platform to increase the accuracy of its mapping system, real time data, and its cloud offering for cars. The company sold 3.2 million new vehicle licenses in Q4 of 2013, up 23% sequentially. Expect Nokia to continue to milk the automobile market in the short, mid, and long term with its offerings from the HERE division. Nokia's Advanced Technologies division saw both a yearly and quarterly decline in revenue and margins, and investors are beginning to realize that it will take a significant amount of time before the division can unlock the true potential of its massive patent portfolio due to lengthy trial processes and the more than one year away Samsung arbitration case. However, this division will experience a boost in revenues once the Microsoft deal closes and the software giant begins to license Nokia's collection of patents. 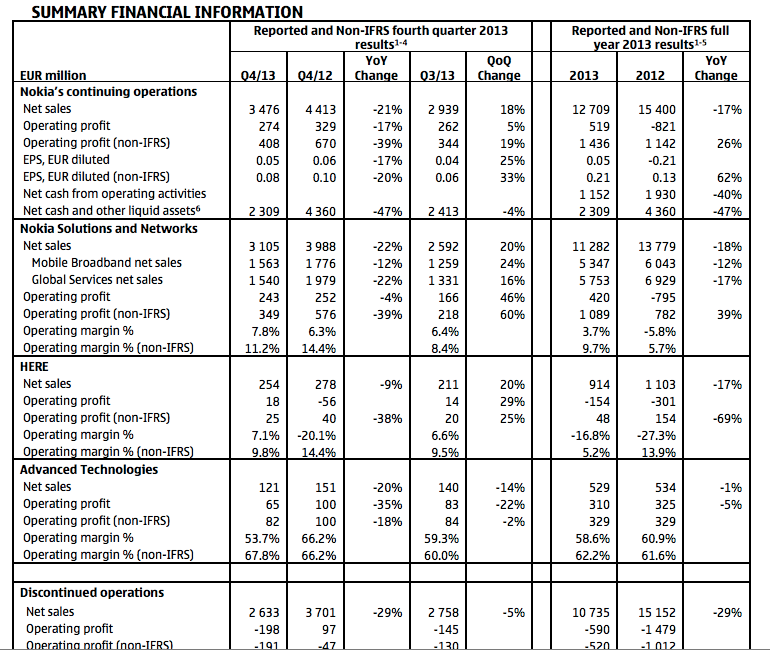 Nokia's Handset/Device division (discontinued operations) performed miserably for the 4Q of 2013. A relatively strong holiday season did not help lift Lumia sales this past quarter, and the company failed to penetrate the ever-important high-end market, even with its plethora of high-end offerings. The company's 2013 Lumia sales doubled year over year, but the dismal 4Q results illustrate how big of a headache the division will be for Microsoft in the first few quarters of integration. This monkey will soon jump off of Nokia's back and onto Microsoft's. It should be noted that thanks to Nokia's terrible performance in recent years, the company will be able to shield approximately $15 billion in future profits made in Finland. After listening to Nokia's conference call, one thing's certain, the anticipation is building, and investors are getting antsy, especially those that showed up late to the party. "After the Close of the Deal"
Nokia executives gave little food to feed analysts with during Thursday's conference call. The juicy details surrounding a new CEO, dividend reinstatement, strategy moving forward, details regarding patent sums, and more were all avoided and would not be discussed until "after the close of the Microsoft deal." In fact, Nokia executives said something along the lines of "after the Microsoft transaction closes," or "after the Microsoft deal", more than 15 times during the conference call. Clearly there is a lot of exciting, value generating information to be shared with investors, but the company is taking the cautious route and waiting for the Microsoft deal to officially close before spilling the beans. With China being one of the last major regulators waiting to approve the Microsoft/Nokia deal, an announcement of the deal closing can come any day now, and I expect a number of positive announcements from Nokia's management to follow shortly afterwards. Nokia is now a waiting game, and may in fact be labeled as dead money until the announcement of the deal closing and Nokia's actions moving forward, but those announcement can come at any moment, a few days, a few weeks, and no more than two months, which is why Nokia is an attractive short term play after Thursday's strong sell off. Shares of Nokia jumped off a mini cliff on Thursday, but the climb back is not too far off, and the company will have plenty of boosters in the coming weeks to help it potentially break through its triple top resistance of approximately $8.20 to new 52-week highs. There is a possibility that Chinese regulators may delay the approval of the Microsoft/Nokia deal, and any delay in approval would surely send Nokia shares deep in the red. This is a risk all current and prospective Nokia investors need to consider, but I view it as extremely unlikely since Nokia has already received a majority of the necessary regulatory approvals. Long-term oriented investors should consider the growing momentum of NSN contract wins, the imminent reinstatement of Nokia's dividend, the 2015 Samsung (SSNLF) patent arbitration, and the recent revelation of key Nokia patents targeting Google (GOOG) maps that date back to before Google's inception as reasons to hold on to shares of this turnaround company. Speculative short-term investors should keep their mind fixated on the announcement of the Microsoft deal-closing coming by the end of March and sell into the news. Expect a number of announcements from Nokia's management that will boost its share price significantly higher than current levels of $7.03 once the announcement is made. Information was sourced from Nokia's Q4 2013 earnings release and conference call. 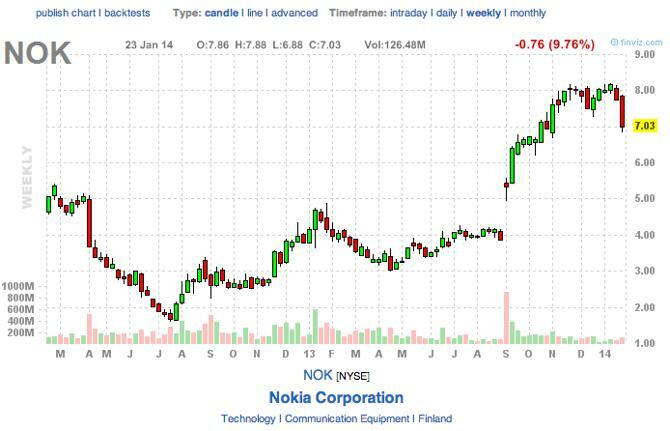 No Comment to " Nokia: Anticipation Grows As Investors Get Impatient "